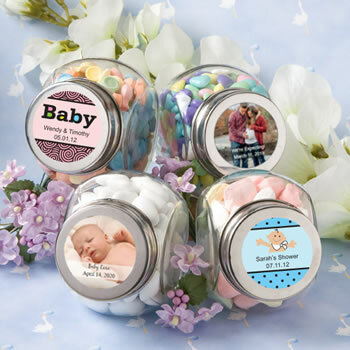 Add a touch of nostalgia to your event with our baby shower glass jar favors. Designed in the classic glass candy/cookie jar shape, these unique favors measure 2 .75" by 1 .75" and are just the right size for a sample of your favorite treat. Customize these baby shower favors with your choice of color and design as well as your names and baby shower date. The self-sticking labels are easy to affix onto the silver metal screw top lid. A wonderful gift that can be reused long into the future, your guests will love these baby shower glass jar favors. These mini jars are so cute & hold a lot mire candy than you would think. The stickers are perfect & go with our baby shower theme. Wish i could post a picture of the final look. I arranged a baby shower for my friend and nicepricefavors was a saver! I found all my favors i needed in cheap price compared to other sites. Also, they could print extra labels for me. My order was shipped very quickly. I am happy to be their customer! This item was a huge hit and people were pleased to receive it....i filled it with custom candy and tied curling ribbon around it...i prefer giving out useful favors in stead of a dust collector and this little jar will have plenty of uses...great price from this vendor and the items arrived on time and well packed. Purchased these for a baby shower. They came really quickly and were adorable on my tables. People loved them! We got the jars for our sons first birthday buffet candy station. They are perfect and were described as it was on their site. The sticker label that came with it was super cute. It may seem small to others, but we thought it was perfect! Quality of the jar was...ummm...I am speechless because it is GREAT! The size and quality of the jars were very good. The customized labels were well made too. The jars are perfect favors for a baby shower that I am hosting, the only complaint that i have is that out of 120 jars ordered 2 were cracked, other than that I love the process of choosing your label and design in color it saves lots of time. These arrived fast. This was for a baby shower for a girl. I put about 5 pieces of some pink and white taffy in them. The labels were cute but the writing was a little small. A few of the jars were hard to open and close. Overall I was very pleased. Some of the jar were misshaped. The order did arrive on time which was great. LOVE THEM!! They are PERFECT for personalized favors! Our guests loved them as well! Love the personalization and something different...baby theme yet not baby theme. Quick delivery and well packaged. Thank you!! Really nice jar to fill with m&ms for a baby shower favor. These jars worked great for a baby shower. There were 10 that were either broken, cracked or bubbled but I guess out of 200 that's not bad. Loved these!! Arrived quickly and they were very cute!! These jars were so cute! They are inexpensive, and the guests loved them! I liked being able to personalize the stickers.